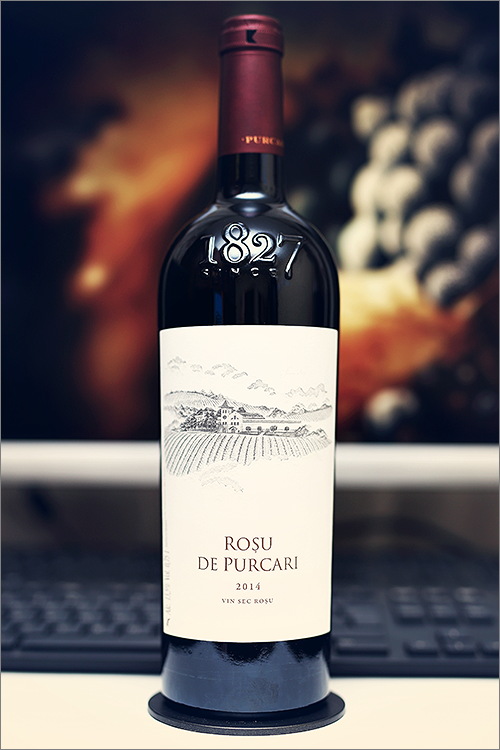 The wine we are going to review today is a classic Bordeaux-style blend with the label ‘Made in Moldova’ – a wine that has acquired a legendary status over the years – Rosu de Purcari 2014 by Purcari. The blend is composed of cabernet sauvignon, merlot and malbec varieties, made from grapes harvested and selected by hand. It was produced using traditional methods, thus, the wine was aged for 18 months in french oak barrels – this blend is nothing less than a bottled art and is part of the winemaker’s flagship line of premium wines that are famous all over the world, but let’s get rid of the theory part. Without further ado, let’s move on straight to the tasting! Deep and noble garnet color, with garnet-indigo shades towards the rim of the glass. The nose is strong, filled mostly with blue and black fruits flavours: ripe sour cherry, violets, ripe blue plum, blackcurrant, ripe blackberry, boysenberry, ripe blueberry, marionberry, lolyberry, wildberry, cherry tree wood and insistent irony notes. An instant later the nose is filled with elegant notes of medium roasted oakwood, red pepper, nutmeg, rooibos tea, cloves, leather, black soil and some subtle hints of anise. The wine is dry, with high alcohol level, high acidity and fine tannin. It feels elegant, velvety and noble, with a nuanced fruity-savory accent. This is a firm, supple and complex wine, as it tastes bold and seedy-tart on the mouthfeel. The wine has a good overall balance and a very harmonious structure, with a lean and crisp mid-plate. It has a long finish and a very balanced, velvety-elegant aftertaste. This is definitely a fine Wine of Moldova and the overall rating says the same, with 91.4 points scored it is right there, among the best wines we’ve tasted so far. Please click on the chart icon on the left in order to get to the wine rating page, where you can find all the wines we’ve tasted to date. Conclusion: this is a firm and noble wine that is yet on the rise – not yet in its prime form, therefore we would suggest 2 or 3 more years of bottle ageing. Despite its youthfulness, the wine has a fine and ripe tannic grip on the mouthfeel, which leads to a full-bodied mid-palate, firming on beautifully with a spicy-velvety finish. This wine blend has a very harmonious balance between fruit and wood, where neither dominates over the other, but fusion togeher into a subtle spicy-supple mix of aromas to gain more grip on the finish, mixing power with finesse. In order to amplify its elegance, we would recommend to pair this wine with soft-textured meaty dishes, like for example a blue-rare tournedos rossini steak or a heirloom tomato carpaccio with peppercorn mix. Enjoy!